I worked on five key images with several variations of each. The theme was the idea of an enclosure, developed from drawings made in Greece. I used the technique of monotype with woodcut for some, and also produced five woodcuts to edition. 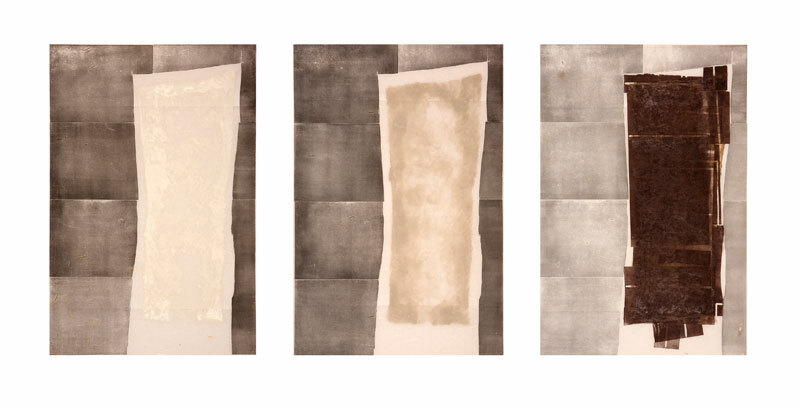 All images are 90 x 60 cm and printed on full sheets of Chinese handmade paper 145 x 75cm. For exhibition they can be displayed without frames, as was done on the final days of the residency. Each image is printed on handmade Chinese paper, 145 x 75 cm. Pigments mixed with transparent medium were used to create colours for printing. The ‘enclosures’ were carved from blocks of Japanese plywood. These images are unique state prints. 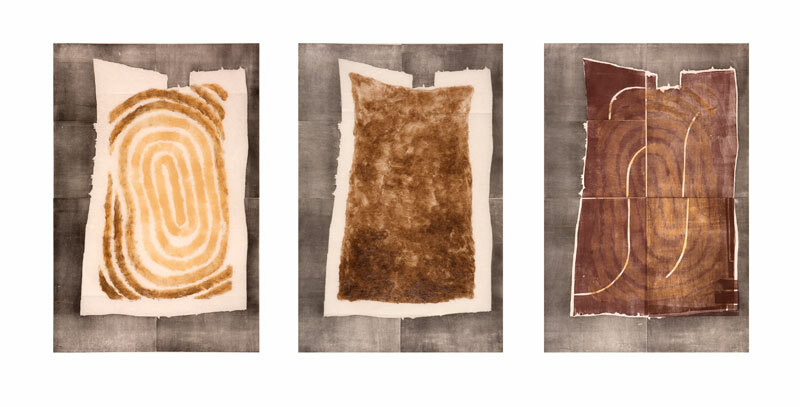 Enclosures, Series 3a, Woodcut and monotype prints on Chinese paper, 150 x 225cm. 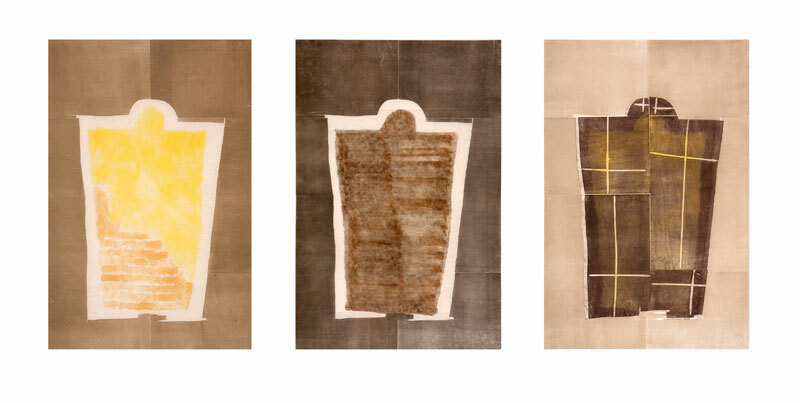 Enclosures, Series 1a, Woodcut and monotype prints on Chinese paper, 150 x 225cm. 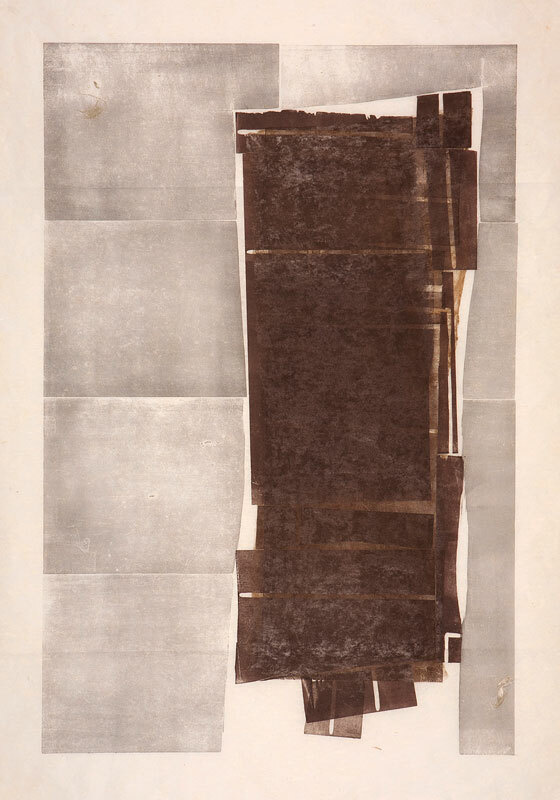 Enclosures, Series 2a, Woodcut and monotype prints on Chinese paper, 150 x 225cm. 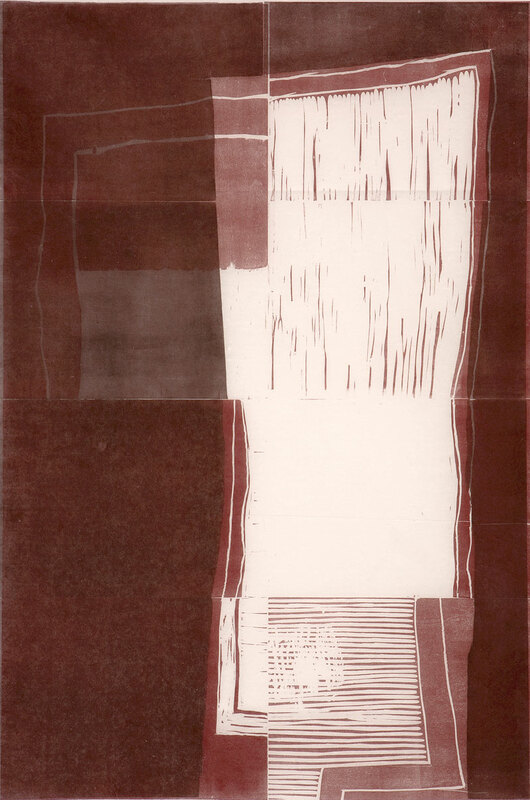 Enclosures 2C, monotype & woodcut on Chinese paper, unique state print, 90x60cm (image), 2011. Enclosures 2A, monotype & woodcut on Chinese paper, unique state print, 90x60cm (image), 2011. 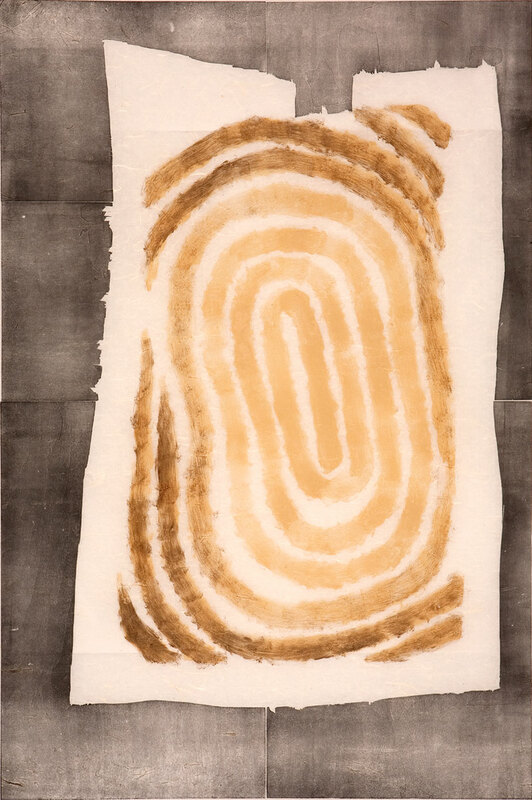 Enclosures 1C, monotype & woodcut on Chinese paper, unique state print, 90x60cm (image), 2011. 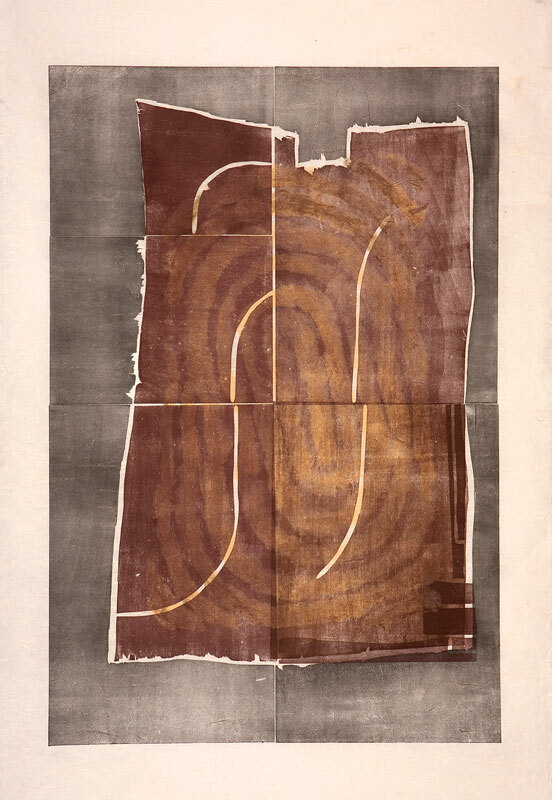 Enclosures 1D, woodcut on Chinese paper, unique state print, 90x60cm (image), 2011.